Our customers love our cabinet painting services as an alternative to replacing their kitchen cabinets or bathroom vanity cabinets. We can also paint any of your home’s office cabinetry, built in shelves, garage cabinets or shelving, or any other type of built in woodwork you need painted. You’ll receive a fast and friendly free estimate from our professional painting contractors. With our affordable, value based rates, you’ll soon find out why so many homeowners in the Woodstock area choose us for all their painting and home improvement needs. One of the things that sets us apart from other painting companies is that our high quality paint is included at cost. 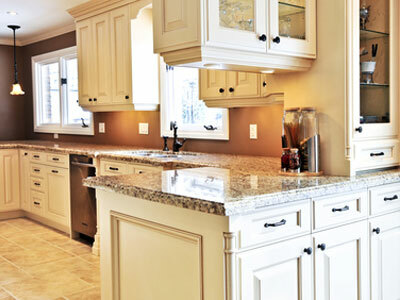 You’ll love that your high quality Sherwin Williams paint will give you long lasting results for your cabinet painting. When you hire a pro to handle your interior painting or cabinet painting, you know you should be getting professional results that last. And you know that the project should be affordable, go smoothly, and be easy for you to have to deal with. Our contractors will arrive on time, will be supervised, and will treat you and your home with the courteous respect you deserve. Not to worry if you don’t have any ideas on cabinet painting because we can help you figure out the best color and painting techniques to go with your home. With every painting project we are hired for, you’ll receive a free color consultation that can help you achieve the results you desire. Our painting contractors have more than enough experience to know that without the proper preparation process, there’s no way your cabinet painting will come out looking professional and no way the work will last as long as it should. Whether it’s wood, drywall, metal, or some other surface we’re painting, we will always follow an extensive, step by step preparation process for that particular surface. We also make sure that every other aspect of the project is well prepared, such as protecting your flooring and furnishings and ensuring the project area is cleaned at the end of every work day as well as when the project is finished. If you are looking for cabinet painting, cabinet staining or cabinet refinishing in the Woodstock, GA area then please call One Man and A Brush at 678-368-5115 or complete our online request form.